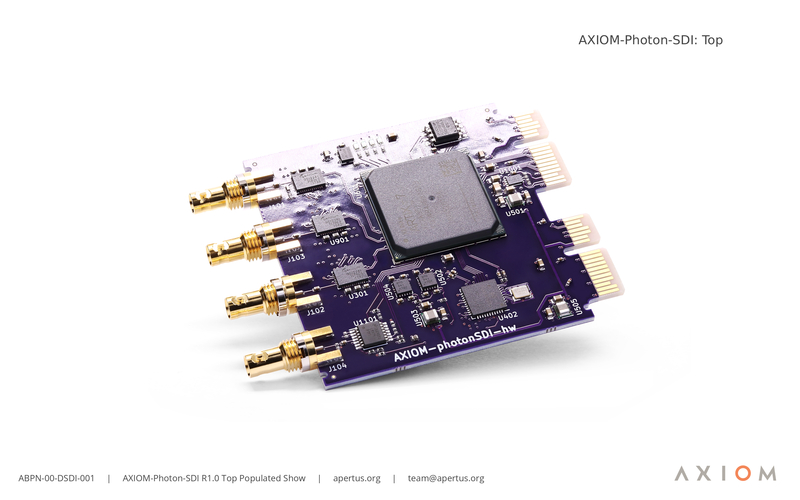 The AXIOM photonSDI hardware is an extension board for the apertusº AXIOM Beta open source camera that adds 6G SDI connectivity to its features. The board has two independent 6G SDI outputs that can both output the same image, different images, or be used in a dual 6G configuration that allows the transmission of 4k video material at 60 frames per second. Additionally the board contains a 6G SDI input for synchronisation and blending and a legacy synchronisation input. A description of a desired SDI connectivity is created using the LiteX framework (a fork of Migen). The framework generates a Hardare Description Language (HDL) reprensentation in Verilog. The HDL is passed to the tool chain which generates a configuration for the chip on the evaluation SDI Extension Board. The configuration is loaded onto the chip on a base board that is plugged into the camera. Camera with chip has new functionality for connecting to professional SDI video equipment. AXIOM PhotonSDI PCB Top unpopulated. AXIOM PhotonSDI PCB Bottom unpopulated. 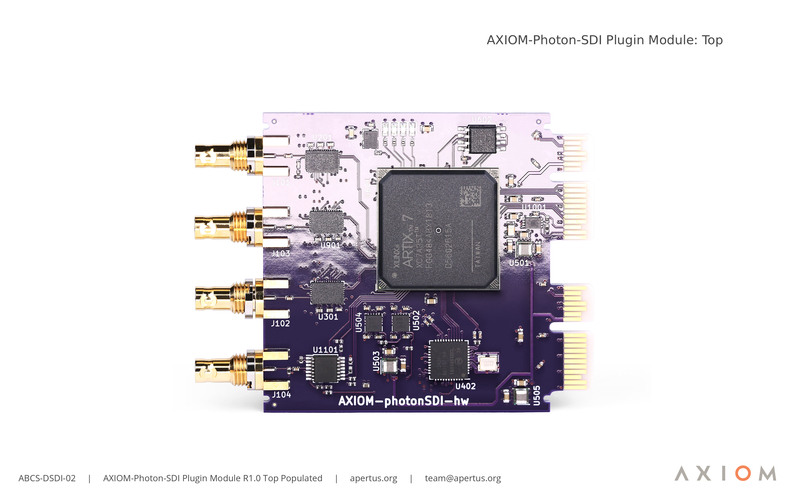 AXIOM PhotonSDI PCB on custom debugging module. Tell us that you are using photonSDI. Cite photonSDI in publications related to research it has helped. Send us feedback and suggestions for improvements. Send us bug reports when something goes wrong. Send us the modifications and improvements you have done to photonSDI. The initial development was sponsored by the German Federal Ministry of Education and Research (BMBF) via their Prototype Fund. An industry standard serial digital interface (SDI) connection plugin module will provide a nominal data transfer rate of 3G/6G. 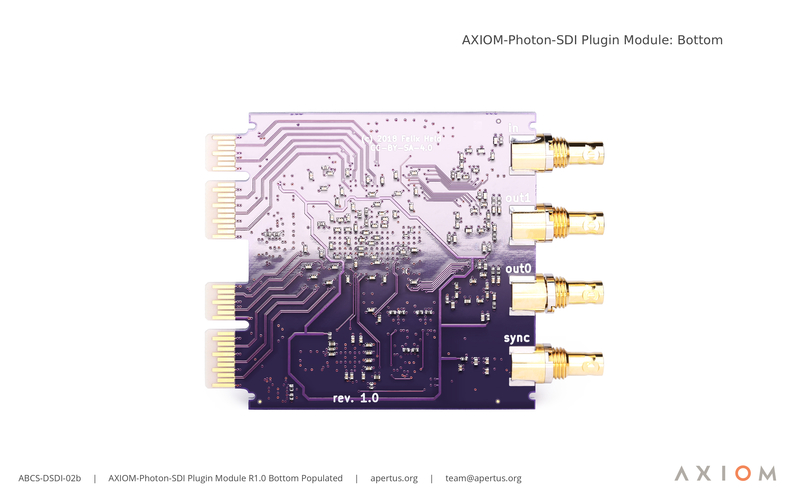 Projects using PhotonSDI: AXIOM Beta, HDMI2USB, Numato Opsis.